The painting depicts Ganesha, the Hindu elephant-headed god, believed to be the Remover of Obstacles and the god of domestic harmony and of success. He is the most revered of all the Hindu gods, and is always invoked first in any Hindu ceremony or festival. 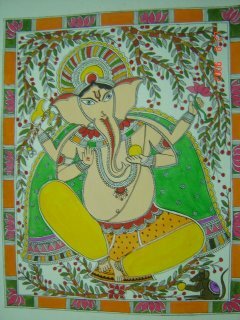 Ganesha is the son of Parvati (the wife of Shiva, the Destroyer).